DuoDrive is the most efficient shaft-driven propulsion system available today, boasting increased efficiencies of up to 30 percent over standard systems. 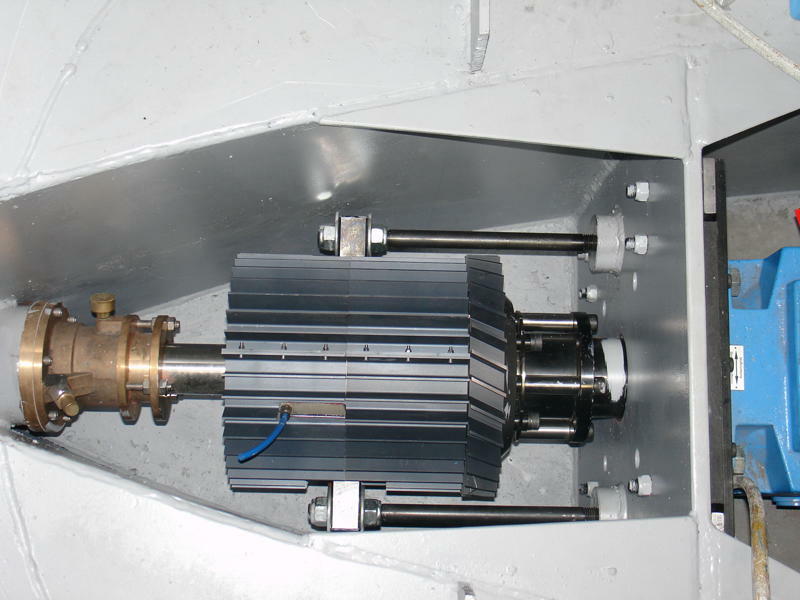 With an award winning gearbox developed by engineers working in Formula 1, the DuoDrive contra-rotating propeller system offers significant increases in performance for owners who require tried and tested shaft drive configuration for their vessel. Contra-rotating stern drives and pod-drive systems have been around for a while and demonstrate the performance advantages and cost savings of contra-rotating propeller technologies. Stern and Pod-drive systems must perform both craft ‘power’ and ‘steering’ duties and the properties of the propellers are compromised to deliver both roles. The result is a trade off in ‘power’ performance. In contrast, DuoDrive requires NO compromise and is engineered to maximise performance…further improving speed, responsiveness and fuel efficiencies. 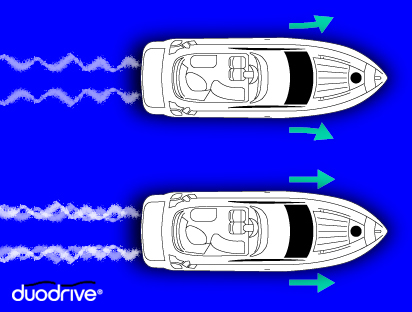 Almost all Stern-/Pod-Drive systems are located at the stern of the vessel; at slow speed and at times of acceleration, they exert high rotational forces on the craft to produce bow-lift and stern-dig. This actually increases vessel drag, increases power requirement and increases fuel consumption. In contrast, as a shaft-drive system DuoDrive transmits its power closer to the centre of gravity, with minimal rotational effect, and so uses less power and fuel at slow speed and accelerates more quickly and fuel efficiently as well. DuoDrive is also outstanding for vessels where slow speed loiter is required; DuoDrive contra-rotating propulsion allows vessels to operate on a single engine without wasteful, fuel-sapping torque steer…reducing costs, noise and vibration. Contra-rotating propellers eliminate waste; two propellers, one immediately ahead of the other, rotating in opposite directions capture more of the engines energy for greater thrust, responsiveness and efficiency. The result? Reduced drive losses, less energy required for given speeds and faster acceleration onto the plane or to sprint speed performance. The slipstream from contra-rotating propellers is almost smooth and straight, with little twist. When a single propeller accelerates, a significant percentage of the power delivered to the propeller also goes into twisting the water around, does nothing in providing propulsion; it is, simply, wasted. Duodrive’s contra-rotating propellers dramatically reduces this waste and can achieve 15 to 40 per cent efficiency improvement vs single propeller sets. DuoDrive provides the ideal solution with a compact, high efficiency propulsion system custom made to suit your engine and craft specification. 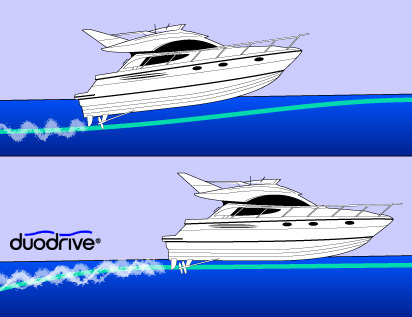 The performance and economy advantages of DuoDrive propulsion are exclusively matched with the high performance hull, stabiliser technology and weapons/surveillance systems we offer. This exclusive combination enable Missionkraft to provide new levels of lifetime performance, comfort and cost effectiveness. Click panels for more information. Please Contact us for information or to discuss your requirements. Missionkraft are proud partners of DuoDrive Limited. DuoDrive and the DuoDrive logo are trademarks of DuoDrive Limited.